AMC’s The Walking Dead returns from its midseason eight break with episode nine airing February 25, 2018. 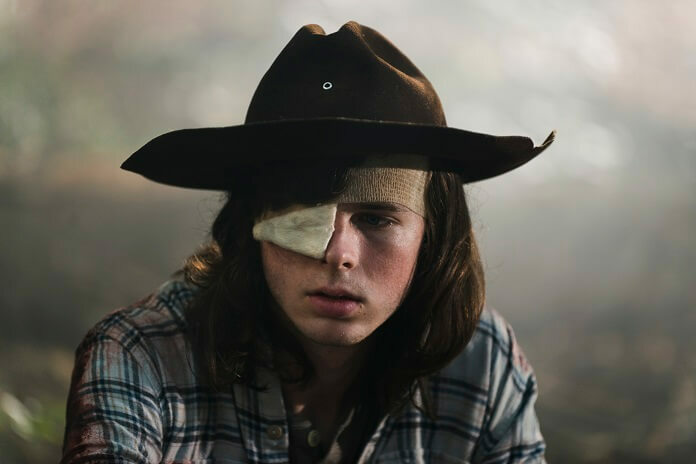 In season eight episode eight we learned Carl had been bitten and that the communities didn’t have the ability to defeat Negan and The Saviors when they took a divided approach to attacking their enemies. Teasers for season eight’s second half indicate we’ll finally find the Hilltop, the Kingdom, and Alexandria banding together as one fierce fighting force. The major fight scenes will come later in the season as episode nine concentrates on Carl’s final hours. The walker attack and the bite scene is one of the opening shots in the episode, followed by Carl (Chandler Riggs) leading his new friend, Siddiq (Avi Nash), into the sewers and setting him up with food and blankets. Back at home, Carl changes out of his bloody clothes and attempts to deal with his fate. He’s handed a note written by Michonne saying she had to go check out things for herself. He then takes time to write his own notes for those he cares about. He spends time with his little sister, even posing for a photo so she’ll remember him. Overall, he appears to be in good spirits considering he has no chance of surviving more than a few more hours. Michonne (Danai Gurira) returns, he waves, and then turns his face to the sun, smiling. Morgan (Lennie James) is still on sniper duty and watches as the Saviors take down walkers, firing from inside their complex. After making a path through the walkers, the Saviors emerge and begin firing into Morgan’s hiding place. Morgan yells for everyone to get out, emerging from the building into a group of walkers. He lures them into position so that when the Saviors make it out of the building he was hiding in, they are immediately set upon by walkers. Morgan then makes it to the road and watches a small caravan drive by. He sprints after them. Carol (Melissa McBride) and the survivors from The Kingdom make it to safety, and then she heads back to rescue Ezekiel. Henry wants to go with her, but Carol tells the boy to stay put. Down in the tunnels, Rick (Andrew Lincoln) and Michonne are heartbroken as they look at Carl’s bite wound and what it means sinks in. Carl didn’t know if he’d get the chance to say goodbye, so he wrote letters which he now passes over to his dad. Explosions from Alexandria provide background noise as Carl tries to get his dad to understand it was just an accident he got bit. Over at The Kingdom, Ezekiel (Khary Payton) is stoic, glad his people are safe. Gavin (Jayson Warner Smith) reveals he’s always liked Ezekiel but then Rick had to plant all these big ideas in his head. Morgan makes it to The Kingdom and Carol’s not far behind. They decide to avoid all the Saviors until they have no choice, and Morgan informs her Henry is there too. Morgan spotted him up ahead in the dark. Carl’s condition worsens and Michonne and Rick try and make him comfortable. Siddiq offers some medication, saying it will help with the fever. In tears, he tells Rick that Carl should have these drugs because they seemed to have helped his parents with their pain. Rick asks Carl if he knew Siddiq was a doctor, but Carl says he only rescued Siddiq because he needed their help. He wouldn’t have made it alone. Rick, tenderly, gives Carl the medication. Michonne loses it and tells Dwight (Austin Amelio) to make the explosions stop as the walls vibrate. Rosita thinks they should take everyone to the Hilltop, but Dwight reminds them the Saviors are looking for them in the woods. Dwight wants them to stay there until the Saviors leave, saying the Saviors will be finished in Alexandria soon because they have to be running out of ammunition. Rosita changes her mind and agrees. 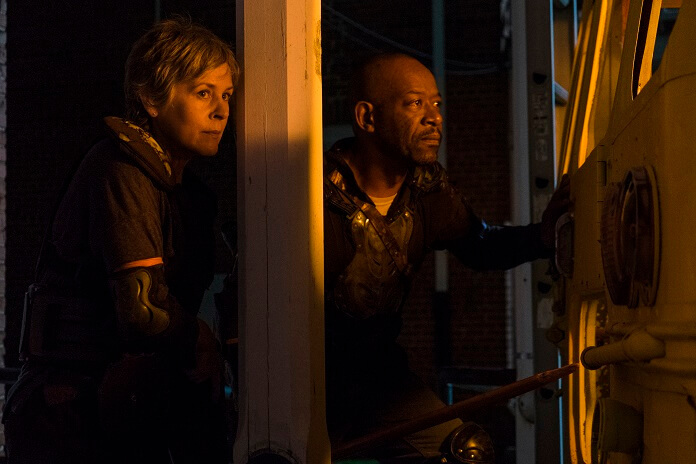 Carol and Morgan quietly make their way through the streets, watching as the Saviors put out fires. They have no choice but to go through the courtyard and be exposed, and fortunately they’re able to take down the first Saviors they meet without making any noise. Elsewhere in the city, Gavin wonders if this situation will go south. Ezekiel gives him no reason to believe it won’t. The group can hear the Saviors leaving Alexandria, but Daryl’s not sure they’ve all gone. He heads up to take a look, taking a few men as backup. Carol and Morgan continue to creep through the streets. Morgan sees men loading a truck and doesn’t listen when Carol tells him to leave them alone. With Carol watching his back, Morgan takes out these Saviors. Gavin reminds his people to leave room in the truck’s bed for Ezekiel, suggesting they provide him with a pillow for his last ride. Gavin seems genuinely upset that everything has to get dark, ugly, and inhumane. Ezekiel tells him it’s not too late to change his mind. Gavin calls his men over the walkie talkie but they don’t respond. He grows concerned and backs up next to Ezekiel as gunfire breaks out. He yells at his small group to get Ezekiel back inside the building. And now we see Rick’s red, tear-streaked face that was featured in closeups at the beginning of the season. Following that is a flash-forward to Eugene handing Judith an apple while a grey-haired, long-bearded Rick looks on smiling. We then see another flash-forward to Rick and Michonne burying Carl. In the tunnels, Rick cries as he asks Michonne to take Judith. Daryl volunteers to take Judith as the group say their goodbyes to Carl. Carl smiles and laughs at his little sister, telling her to be good for Michonne and dad. He tells her to listen to what dad says, but that she will have to show him the way sometimes. He then hands over his beloved hat – the one that never leaves his head. It was Rick’s, then Carl’s, and now it’s Judith’s. Carl explains the hat made him feel as strong as his dad and helped him survive. Judith cries and reaches out, and Daryl hugs her close. Daryl reminds Rick he saved all these people. Siddiq says goodbye, thanking Carl for rescuing him. He promises to honor his memory by showing Carl’s friends and family that what he did wasn’t for nothing. He swears he’s going to honor Carl, and Carl smiles and they shake hands. Carl welcomes him to the group. Michonne and Rick are the only ones who remain with Carl as his condition further deteriorates. Gavin organizes his group inside Ezekiel’s building. Gavin wants to end this all now, telling his people to take out everyone they see. Ezekiel continues to ask Gavin if this is what he really wants, and Gavin claims it is. A door explodes and the Saviors open fire. Gavin halts the fire and then puts a gun to Ezekiel’s head, warning Carol and Morgan to give up or Ezekiel’s dead. They don’t listen and come in guns ablazing. Morgan is attacked but manages to get the upper hand and rips out his attacker’s intestines. During the fight, Gavin is shot and his gun slides across the floor. Ezekiel grabs it, but Carol and Morgan have already taken out everyone else in the building. Gavin flees and Morgan hunts him down. Rick wants her to help carry Carl out of the tunnels. Morgan isn’t even hurrying to catch up with the wounded Gavin, striding after him at a steady pace. Rick and Michonne help Carl through a burning Alexandria. Gavin hunkers down scared as Morgan walks toward him, staff trailing in the dirt. Gavin thinks he’s safe when he sees Morgan’s shadow disappear, but of course he’s wrong. Michonne and Rick help lower Carl to the ground in the church, and Carl thanks them for getting him there – meaning who he wound up being, not his physical location. Carl recalls that back at the prison when they were attacked, he watched a kid about his age start to put down a gun. Carl shot him, even though he was giving up. He confesses he thinks about that kid and how easy it was to kill back then. Morgan grabs Gavin and then tosses him on the ground out in the open. Gavin claims he’s a good man who keeps his word and tells Morgan that he can go back to the Hilltop which is still standing. When Gavin says things can go back to how they were, Morgan says no. Rick tells his son that everything he had to do he did when he was just a boy. Carl reminds his dad that he saw him change, and that’s why his dad brought everyone together and brought enemies in to live with their group. Carl knows his dad did that for him, to help him stop from becoming the person he was transforming into. Gavin continues to talk as Morgan holds his staff right in front of his face. Morgan forces Gavin to his feet. Ezekiel asks Morgan to relent, saying they won. Ezekiel thinks Gavin will live with what he did, knowing it’s his fault. Carl tells his dad he can’t kill them all because there has to be something after. Carol also reminds Morgan that he can be better than this, that he doesn’t have to take Gavin’s life. Morgan, however, says he has to. He had a plan but now he must do this. Before he can act, Henry kills Gavin from behind. Morgan, with tears streaming down his face, doesn’t speak. Carl tells Rick and Michonne that they haven’t seen how it could be, but he has. It turns out the flash-forwards are just Carl’s version of the future. The scenes of happy times, a grey-haired Rick, and healthy crops have been Carl’s vision of what the world could look like. Rick tell his son this has all been for him since the start. The farm in Atlanta and everything since then has been for Carl and then Carl and Judith, and nothing will change that. Rick promises to make Carl’s vision for a new world real. Carl grips a gun handle and tells his dad and Michonne he must do this himself. They cry and Carl tells them he loves them. Rick is overcome with emotion as he kisses his son’s forehead one final time. Rick promises Carl he’ll make it real. We don’t see the gunshot, but we hear it as Rick and Michonne wait outside the church. They then dig a grave, pausing to cry. Another vision of Carl’s shows Negan (Jeffrey Dean Morgan) is part of the group and full of smiles. Season eight episode nine ends with Rick, obviously in pain and bleeding from his abdomen, sitting with his back against a tree. He says, “My mercy prevails over my wrath” as the episode ends.